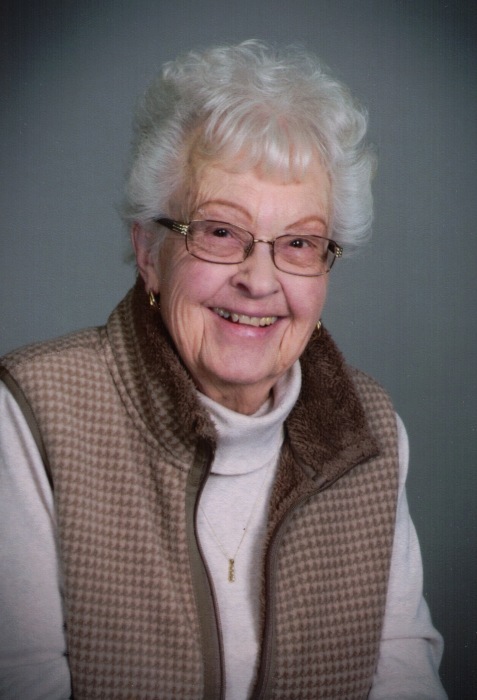 Joan Elizabeth Thompson, age 96, of Owatonna, passed away January 31, 2019, at her home. Joan was born September 9, 1922 in Cedar Rapids, Iowa and grew up in Owatonna Minnesota. She was a graduate of the Owatonna High School Class of 1940 and upon graduation, worked in the office of the U.S. Employment Service branch in Owatonna. Joan married Philip Thompson on May 21, 1949 at the former St. Hyacinth Church. She was a lifelong member of the St. Joseph Church, serving on the funeral committee and a greeter for many years. She was an avid bridge player, and for 65 year she played in the same bridge club with her friends. Joan was a homemaker and loving mother of her six children; Susan (Grant) Cassem, Bill (Lorie) Thompson, Patricia Radke, Sara (George) Wacek, Katie (Scott) Holzerland, Steve (Brad Larson) Thompson. She was also the grandmother of 14 grandchildren, 10 great-grandchildren, and the aunt to many nieces and nephews. She was preceded in death by husband, Philip, parents, Celestine, Zellda, and Harry Romer, and sister, Jean Quigley Reed. The Mass of Christian Burial will be 11:00 AM Monday, February 4, 2019 at St. Joseph Catholic Church, Owatonna. Friends may greet the family from 9:00 – 11:00 AM on Monday at the church before the funeral. Burial will be immediately after with a celebration lunch to follow. Memorial preferences are to Allina Hospice: Patient Care Fund and St. Joseph Parish of Owatonna.